» Forget ‘exchange;’ what about health? Forget ‘exchange;’ what about health? 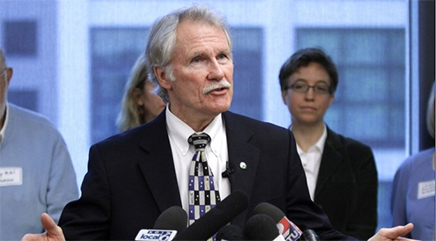 Governor Kitzhaber says he’s angry about the all the mistakes by state officials that resulted in the Cover Oregon health insurance website or “exchange” still not working properly. But that trouble is about insurance and bureaucracy, two words that are almost synonymous. And it is small and temporary compared to what’s likely to happen with actual health care in Oregon in the next few years. The governor held a press conference Thursday after releasing the outside report that detailed the problems in his administration connected with Cover Oregon. (He may have other problems elsewhere, considering that his March 21 press statement online was dated March 30.) Some people are out of a job including Bruce Goldberg, head of the Oregon Health Authority. Fair enough, but again, that’s just insurance, most of it apparently Medicaid paid for by public funds, and how long that money will hold out nobody knows. The real question is whether any of this translates into better health care for everybody, which as the governor pointed out has been his goal for 25 years. Interestingly, they are still showing the Cover Oregon ads on the Spanish language channel out of Salem, albeit with a phone number. I wonder if Mexico offers a similar program to US citizens living there? Use Cannabis as medicine … and fix the national debt! A cancer patient is worth about $350,000 to Samaritan. With Cannabis, you can treat cancer for less than $5000. Instead of having your hair fall out, puking all the time and wishing you were dead you’ll sleep a lot and likely get healed. The current medical system is a sham.